Get ready to use farm fresh foods to cook up daily feasts! Build your own pizza from scratch, create your own salsa recipe, and collect fresh eggs from the chicken coop to cook a hearty farm breakfast. Campers harvest fresh ingredients from the farm and garden to gather the basic ingredients for each day’s culinary adventures. Each week includes a special themed day – campfire cooking, homemade ice cream and desserts from the farm, edible food art and more! Our goal in Cooking Camp is to have lots of fun while introducing campers to cooking and eating food right from the farm. All campers will harvest from the farm, chop, measure, mix, and prepare food, follow recipes, and try new foods over the course of their week. 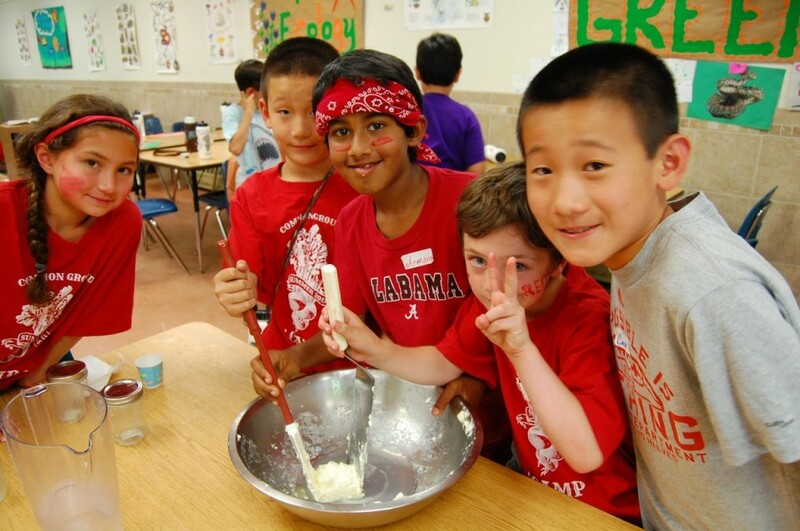 Campers rotate through cooking activities in small groups, so no camper spends all day cooking – we have lots of different activities to enjoy! 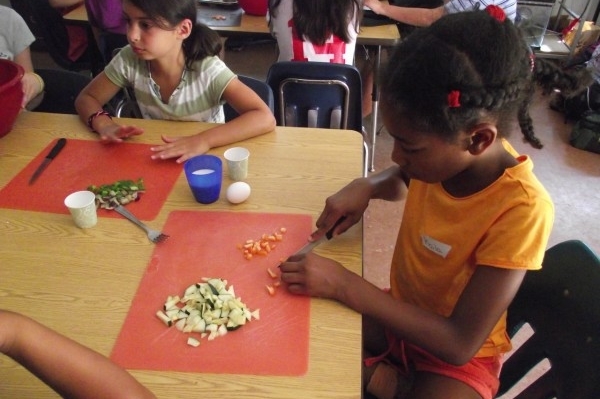 Cooking campers will also visit the farm animals, play games, make new friends, go on hikes and adventures in the forest, build forts, and enjoy music and art projects. Cooking Camp is for boys and girls, and our Cooking Camp staff reflect the diversity of our campers – good food is for everyone! The Farm to Feast Cooking Camp classroom is a very popular spot on campus – staff and campers are always peeking in to see what smells so good! Our cooking camp teachers love sharing good food and they send home recipes for their camper’s favorite dishes each week. Please see the “Frequently Asked Questions” page for more details on the qualifications of our camp staff. Camper/Staff ratio: One adult camp teacher and one camp counselor for every 12 children (6:1 child to staff ratio, not including interns or Junior Counselors). All campers receive a camp tshirt and water bottle. Camp hoodies are available for purchase when you register (optional). Interested in multiple weeks? Check out Ecology Camp (ages 5-12) — six weeks of adventures with a consistent peer group, plus field trips and special events!